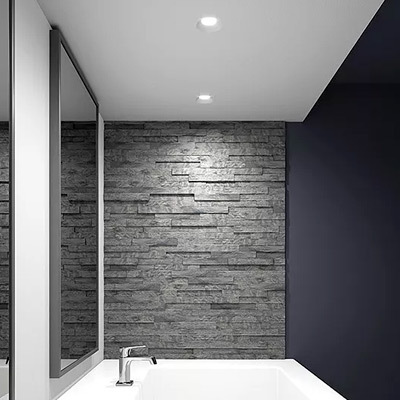 Bathroom lighting is not only useful for providing bright task lighting but it also showcases architecture and design elements. 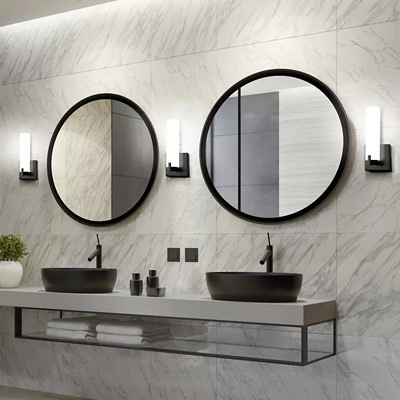 Bathroom lighting means more than just installing a fixture for brighter vanity lighting; modern bathroom light fixtures present striking design elements combined with energy efficiency and bright LEDs. 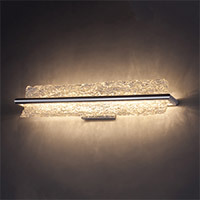 Light bars, sometimes called bath bars, can be placed in various places in your bathroom to create the exact look you want, while pendants, recessed lights, and bathroom wall lights complete the look. Bathroom light fixture options are plentiful and no matter what your style is, you’re sure to find one that’s right for your space. One of the most common bathroom light styles is the bath bar. The versatility and compact profile allow these fixtures to be installed in recessed areas as well as over sinks and vanities. 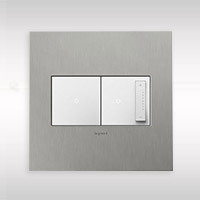 These fixtures have a streamlined silhouette that perfectly compliments contemporary décor and saves space. Bath bars with globe shades are a classic design that has been refined over the years to include highly modernized styles. 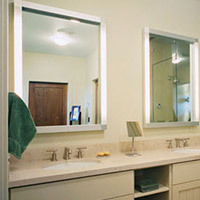 Lighted mirrors are also another popular bathroom lighting choice that not only saves space but increases brightness when light reflects off the mirror. When it comes to bathroom lighting, you are only limited by your imagination. 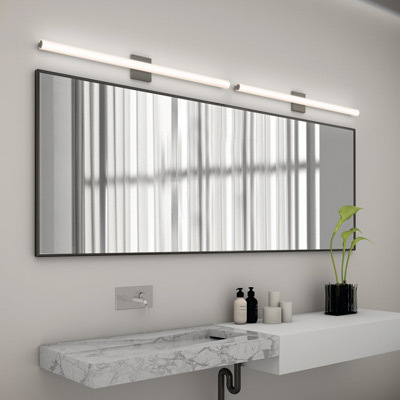 Discover a variety of damp and wet rated bath lights and vanity mirrors from top brands like Tech Lighting, Kichler, and Visual Comfort. The variety of bath and vanity light fixtures available from these key designers allow you to find the perfect fixture for nearly any interior design style. Innovative bathroom fixtures are also available from George Kovacs that embody a modern yet classy aesthetic you'll be sure to love. If you’re drawn to more minimalist designs, SONNEMAN Lighting offers an array of contemporary bath lighting options for a timeless look. 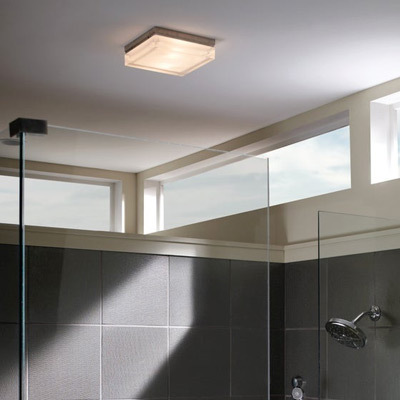 Lastly, make your bathroom energy efficient by choosing LED bathroom lighting from Modern Forms. Once you’ve considered where you’re going to install your fixture, it’s time to pick one out that matches the décor of your bathroom and appeals to your personal style. Determine the square footage of your space, as well as the size of the bathroom fixtures. This will help you avoid buying an oversized or undersized fixture that will look out of place in your bathroom. In choosing a fixture for your bathroom, it’s important to understand how it will function. One of the main distinctions is the difference between damp and wet-rated bathroom lights. Damp-rated lights are certified by Underwriters Laboratories (UL) to work in locations that are exposed to condensation and moisture but will not be fully submerged. A damp-rated fixture will have labeling that indicates its suitable for damp locations. Wet rated fixtures will be labeled ‘suitable for wet locations’ and are appropriate for both indoor and outdoor spaces where water is likely to come into contact with electrical components. Be sure not to limit yourself to just bath bars. 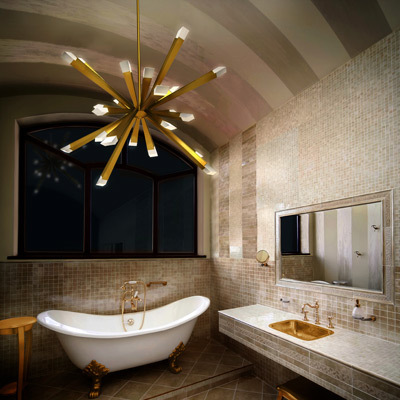 Bathroom chandeliers can liven up your bathroom while simultaneously providing illumination. Also, don’t rule out bathroom pendant lights, as these can be installed in lieu of a traditional bath bar for sleek and modern bath lighting. Flushmount light fixtures are another popular bathroom lighting option with a plethora of colors, styles, and finishes. If you have an existing fixture that you plan to keep, ensure that the new fixture will blend into your space. Aside from style, wet or damp rating, and décor, there are some other considerations when picking out the perfect bathroom light. Some bathroom fixtures require professional installation, so be sure to read the listed specs before attempting to DIY. You should also take note of the type of lighting the fixture provides since this can range from LED bathroom lighting to fluorescent to incandescent. Understanding the pros and cons of each illumination type can further help you make your decision. Should you find yourself struggling with choosing a fixture, you can easily access design advice and live chat with a style expert for instant answers. And once you have your lighting choices dialed in, consider other accents you may want to add to the room to truly bring it to life.